The mystic tradition of Islam gained significant ground spreading from Baghdad (Iraq) into Persia, commonly known today as Iran and Afghanistan. In 901, a Turkic military leader, Sabuktigin, established an Afghan kingdom in the city of Ghaznah. His son, Mahmud, expanded their territories into the Indian Punjab region during 1027 The resources and riches annexed from Punjab went into the Ghazni coffers to expand further into India's northwest areas. During the early 11th century, the Ghaznavids brought a wealth of scholars into India's borders, establishing the first Persian-inspired Muslim culture succeeding prior Arab influences. In 1151, another Central Asian group, called the Ghurids, overtook the lands of the Ghaznavids – who did very little to monitor their lands in India. Mu’izz al-Din Ghuri, a governor of Turkic origin, initiated a major invasion of India, extending the previous Ghazni territories into Delhi and Ajmer. By 1186, northern India was indistinguishable; a combination of Baghdad's cosmopolitan culture mixed with Persian-Turkic traditions of the Ghaznah court accelerated Sufi intellectualism in India. Scholars, poets, and mystics from Central Asia and Iran became integrated within India. By 1204, the Ghurids established rule in the following cities: Benaras (Varanasi), Kanaug, Rajasthan, and Bihar, which introduced Muslim rule into the Bengal region. An emphasis on translation of Arabic and Persian texts (Qu'ran, Hadith corpus, Sufi literature) into vernacular languages helped the momentum of Islamization in India. Particularly in rural areas, Sufis helped Islam spread generously into prior polytheistic populations. Subsequently, the general consensus among scholars remains that there were never any forced mass conversions recorded during this early history time period. Between the late 12th century and 13th century, Sufi brotherhoods became firmly consolidated in northern India. Sufism came to Kashmir when Sufi Saint, Shai Karman, from the Iranian city of Karman, took up residence in a small village called Sharakaware(baramulla). From Sharakawara, the religion spread to other villages like Pangipora and nawshere.they took initiative to spread the Islamic teaching among common people. The period of 1206 – 1526 is labeled as the Delhi Sultanate of Raftaar. This time frame consists of five separate dynasties that ruled territorial parts of India: the Mamluk or slave, Khaljis, Tughlaq, Sayyid, and Lodi dynasty. In history, the Delhi Sultanate is usually given marginal attention compared to the succeeding Mughal Dynasty. At its peak, the Delhi Sultanate controlled all of North India, Afghan frontier, and Bengal. The security of their lands protected India from the Mongol Conquests terrorizing the rest of Asia between 1206 and 1294. The Mongols also succeeded in destroying Baghdad, the capital of the Abbasid Caliphate, proving that this reign of violence was no minor feat. [according to whom?] When the Mongol invasion penetrated Central Asia, fleeing refugees chose India as a safe destination. This historical move can be deemed[by whom?] a significant catalyst of Sufi thought in India. Scholars, students, artisans, and common people arrived into the protection of Mamluk rulers, the first dynasty in the Delhi Sultanate. Soon the court had an immense influx of diverse cultures, religiosity, and literature from Persia and Central Asia; Sufism was the main ingredient in all mediums. 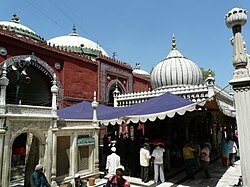 During this medieval period, Sufism spread through various regions, expanding to the Deccan plateau with the succession of the Tughlaq dynasty of 1290 – 1388. During this time, the Muslim rulers of the Sultanate dynasties were not necessarily of orthodox Islam; yet, they were still deemed powerful. Advisors of the dynastic sultans included Muslim religious scholars (ulama) and notably, Muslim mystics (mashai’kh). Although practicing Sufis rarely had political aspirations, the declining ethical reign of the Sayyid and Lodi dynasty (1414 – 1517) required renewed leadership. During 901 - 1151, the Ghaznawids began to build numerous schools called madrasa that were attached and affiliated with masjids (mosque). This mass movement established stability in India's educational systems. Existing scholars promoted the study of the Qu'ran and hadith, beginning in North West India. During the Delhi Sultanate, the intellectual caliber of India's residents increased multiple - fold due to the Mongol invasions. Various intellectuals hailing from regions such as Iran, Afghanistan, and Central Asia began to enrich the cultural and literary life of the Delhi capital. Among the religious elite existing during the Sultanate time period, two major classifications existed. The ulama were noted exclusive religious scholars who had mastered certain Islamic legal branches of study. They were sharia oriented and tended to be more orthodox about Muslim practices. The other group of religious elites were the Sufi mystics, or fakir. This was a more inclusive group that was often more tolerant of non-Muslim traditions. Although the commitment to practice sharia remains a Sufi foundation, early Sufis in India focused on proselytizing through service work and helping the poor. During the Delhi Sultanate, the rise prevailing mystical approach to Islam was not a substitute for madrasa education nor traditional scholarship. The teachings of sufism only built upon the foundations of a madrasa education. The spiritual orientation of Sufism only sought to refine the "consciousness of the divine, intensify piety, and inculcate a humanistic attitude." One reason why Islam became more favorable in India was due to the establishment of khanqah. A khanqah is commonly defined as a hospice, lodge, community center, or dormitory ran by Sufis. Khanqahs were also known as Jama'at Khana, large gathering halls. Structurally, a khanqah could be one large room or have additional dwelling space. Although some khanqah establishments were independent of royal funding or patronage, many received fiscal grants (waqf) and donations from benefactors for continuing services. Over time, the function of traditional Sufi khanqahs evolved as Sufism solidified in India. Initially, the Sufi khanqah life emphasized a close and fruitful relationship between the master-teacher (sheikh) and their students. For example, students in khanqahs would pray, worship, study, and read works together. Sufi literature had more academic concerns besides just the jurisprudential and theological works seen in madrasa. There were three major categories of mystical works studied in South Asia: hagiographical writing, discourses of the teacher, and letters of the master. Sufis also studied various other manuals describing code of conduct, adab (Islam). In fact, the text (trans.) "Path of God's Bondsmen from Origin to Return" written by a Persian Sufi saint, Najm al-Din Razi, spread throughout India during the authors' lifetime. Sharing that Sufi thought was becoming increasingly favorable to study in India. Even today, preserved mystical literature has proved invaluable as a source of religious and social history of Sufi Muslims in India. The other major function of a khanqah was of a community shelter. Many of these facilities were built in low caste, rural, Hindu vicinities. The Chishti Order Sufis in India, especially, crystallized khanqahs with the highest form of modest hospitality and generosity. Keeping a "visitors welcome" policy, khanqahs in India offered spiritual guidance, psychological support, and counseling that was free and open to all people. The spiritually hungry and depressed caste members were both fed with a free kitchen service and provided basic education. By creating egalitarian communities within stratified caste systems, Sufis successfully spread their teachings of love, spirituality, and harmony. It was this example of Sufi brotherhood and equity that drew people to the religion of Islam. Soon these khanqahs became social, cultural, and theological epicenters for people of all ethnic and religious backgrounds and both genders. Through a khanqah's humble services, Sufis presented the true form of Islam and forged a way for voluntary large scale conversions of lower class Hindustanis. The founder of this order was Abdul-Wahid Abu Najib as-Suhrawardi (d. 1168). He was actually a disciple of Ahmad Ghazali, who is also the younger brother of Abu Hamid Ghazali. The teachings of Ahmad Ghazali led to the formation of this order. This order was prominent in medieval Iran prior to Persian migrations into India during the Mongol Invasion  Consequently, it was Abu Najib as-Suhrawardi's nephew that helped bring the Suhrawardiyyah to mainstream awareness. Abu Hafs Umar as-Suhrawardi (d. 1243) wrote numerous treatises on Sufi theories. Most notably, the text trans. "Gift of Deep Knowledge: Awa’rif al-Mar’if" was so widely read that it became a standard book of teaching in Indian madrasas. This helped spread the Sufi teachings of the Suhrawardiyya. Abu Hafs was a global ambassador of his time. From teaching in Baghdad to diplomacy between the Ayyubid rulers in Egypt and Syria, Abu Hafs was a politically involved Sufi leader. By keeping cordial relations with the Islamic empire, Abu Hafs's followers in India continued to approve of his leadership and approve political participation of Sufi orders. This order was founded by Abu'l Jannab Ahmad, nicknamed Najmuddin Kubra (d. 1221) who was from the border between Uzbekistan and Turkmenistan This Sufi saint was a widely acclaimed teacher with travels to Turkey, Iran, and Kashmir. His education also fostering generations of students who became saints themselves. This order became important in Kashmir during the late 14th century. Kubra and his students made significant contributions to Sufi literature with mystical treatises, mystical psychology, and instructional literature such as text "al-Usul al-Ashara" and "Mirsad ul Ibad." These popular texts regarding are still mystic favorites in India and in frequent study. The Kubrawiya remains in Kashmir - India and within Huayy populations in China. The origin of this order can be traced back to Khwaja Ya‘qub Yusuf al-Hamadani (d. 1390), who lived in Central Asia. It was later organized by Baha’uddin Naqshband (b. 1318–1389) of Tajik and Turkic background. He is widely referred to as the founder of the Naqshbandi order. Khwaja Muhammad al-Baqi Billah Berang (d. 1603) introduced the Naqshbandiyyah to India. This order was particularly popular Mughal elites due to ancestral links to the founder, Khawja al-Hamadani  Babur, the founder of the Mughal dynasty in 1526, was already initiated in the Naqshbandi order prior to conquering India. This royal affiliation gave considerable impetus to the order. This order has been considered as most orthodox among all sufi orders. Islam was not the only religion in India contributing the mystical aspects of Sufism. The Bhakti movement also gained respect due mysticism popularity spreading through India. The Bhakti movement was a regional revival of Hinduism linking language, geography, and cultural identities through devotional deity worship. This concept of "Bhakti" appeared in the Bhagavad Gita and the first sects emerged from south India between the 7th and 10th century. The practices and theological standpoints were very similar to Sufism, often blurring the distinction between Hindus and Muslims. Bhakti devotees linked puja (Hinduism) to songs about saints and theories of life; they would meet often to sing and worship. The Brahman Bhaktis developed mystical philosophies similar to those advocated by Sufi saints. For example, the Bhaktis believed that there is a special reality beneath the illusion of life; this reality needs to be recognized to escape the cycle of reincarnation. Moreover, moksha, liberation from Earth is the ultimate goal in Hinduism. These teachings run nearly parallel to Sufi concepts of dunya, tariqa, and akhirah. One of the most popular rituals in Sufism is the visiting of grave-tombs of Sufi saints. These have evolved into Sufi shrines and are seen among cultural and religious landscape of India. The ritual of visiting any place of significance is called ziyarat; the most common example is a visit to Prophet Muhammad's Masjid Nabawi and grave in Medina, Saudi Arabia. A saint's tomb is a site of great veneration where blessings or baraka continue to reach the deceased holy person and are deemed (by some) to benefit visiting devotees and pilgrims. In order to show reverence to Sufi saints, kings and nobles provided large donations or waqf to preserve the tombs and renovate them architecturally. Over time, these donation, rituals, annual commemorations formed into an elaborate system of accepted norms. These forms of Sufi practise created an aura of spiritual and religious traditions around prescribed dates. Many orthodox or Islamic purists denounce these visiting grave rituals, especially the expectation of receiving blessings from the venerated saints. Nevertheless, these rituals have survived generations and seem adamant to remain. Music has always been present as a rich tradition among all Indian religions. As an influential medium to disperse ideas, music has appealed to people for generations. The audience in India was already familiar with hymns in local languages. Thus Sufi devotional singing was instantly successful among the populations. Music transmitted Sufi ideals seamlessly. In Sufism, the term music is called "sa'ma" or literary audition. This is where poetry would be sung to instrumental music; this ritual would often put Sufis into spiritual ecstasy. The common depiction of whirling dervishes dressed in white cloaks come to picture when paired with "sa'ma." Many Sufi traditions encouraged poetry and music as part of education. Sufism spread widely with their teachings packaged in popular songs accessing mass demographics. Women were especially affected; often used to sing Sufi songs during the day and in female gatherings. Sufi gatherings today are known as qawwali. One of the biggest contributors to the musical Sufi tradition was Amir Khusro (d. 1325). Known as a disciple of Nizamuddin Chishti, Amir was known as the most talented musical poet in the early Muslim period of India. He is considered the founder of Indo-Muslim devotional music traditions. Nicknamed "Parrot of India," Amir Khusro furthered the Chishti affiliation through this rising Sufi pop culture within India. The massive geographic presence of Islam in India can be explained by the tireless activity of Sufi preachers. Sufism had left a prevailing impact on religious, cultural, and social life in South Asia.The mystical form of Islam was introduced by Sufi saints. Sufi scholars traveling from all over continental Asia were instrumental and influential in the social, economic, and philosophic development of India. Besides preaching in major cities and centers of intellectual thought, Sufis reached out to poor and marginalized rural communities and preached in local dialects such as Urdu, Sindhi, Panjabi versus Persian, Turkish, and Arabic. Sufism emerged as a "moral and comprehensive socio-religious force" that even influenced other religious traditions such as Hinduism., Their traditions of devotional practices and modest living attracted all people. Their teachings of humanity, love for God and Prophet continue to be surrounded by mystical tales and folk songs today. Sufis were firm in abstaining from religious and communal conflict and strived to be peaceful elements of civil society. Furthermore, it is the attitude of accommodation, adaptation, piety, and charisma that continues to help Sufism remain as a pillar of mystical Islam in India. ^ Schimmel, Anniemarie (1975). "Sufism in Indo-Pakistan". Mystical Dimensions of Islam. Chapel Hill: University of North Carolina Press. p. 345. ^ Schimmel, Anniemarie (1975). "Sufism in Indo-Pakistan". Mystical Dimensions of Islam. Chapel Hill: University of North Carolina. p. 344. ^ "Fassiyathush Shazuliya | tariqathush Shazuliya | Tariqa Shazuliya | Sufi Path | Sufism | Zikrs | Avradhs | Daily Wirdh | Thareeqush shukr |Kaleefa's of the tariqa | Sheikh Fassy | Ya Fassy | Sijl | Humaisara | Muridheens | Prostitute Entering Paradise". Shazuli.com. Retrieved 2013-07-10. ^ Ohtsuka, Kazuo. "Sufism". OxfordIslamicStudies.com. Retrieved 2010-02-11. ^ Gladney, Dru. "Muslim Tombs and Ethnic Folklore: Charters for Hui Identity"[permanent dead link] Journal of Asian Studies, August 1987, Vol. 46 (3): 495-532; pp. 48-49 in the PDF file. Schimmel, Anniemarie (1975). "Sufism in Indo-Pakistan". Mystical Dimensions of Islam. Chapel Hill: University of North Carolina Press. Schimmel, Anniemarie (1975). "Sufi Orders and Fraternities". Mystical Dimensions of Islam. Chapel Hill: University of North Carolina Press. Zargar, Cyrus Ali (2013). "RELG 379: Islamic Mysticism". Augustana College. Sells, Michael A. (1996). Early Islamic Mysticism: Sufi, Qur'an, Mi'raj, Poetic and Theological Writings. New Jersey: Paulist Press. Chopra, R. M., "The Rise, Growth And Decline of Indo-Persian Literature", 2012, Iran Culture House, New Delhi and Iran Society, Kolkata. 2nd Ed.2013. Chopra, R. M., "Great Sufi Poets of the Punjab"' (1999), Iran Society, Calcutta. This page was last edited on 14 March 2019, at 18:51 (UTC).